Probably the two most well-known style periods still showing influences today are Art Nouveau and Art Deco. But there is also a widespread lack of understanding of the styles by many people. Many don’t realize the differences nor the overlaps between them. Art Nouveau (literally “new art”) has its roots in the Arts and Crafts Movement in England, staring in around 1880. That movement, itself, had a great deal of influence on European style choice towards the end of the 19th century. Designer William Morris, whose nature motifs are still extremely popular today, was a key proponent of Arts and Crafts. However, where the Arts and Crafts Movement took a “back to basics” approach, Art Nouveau was different. The overall style of Arts and Crafts took inspiration from the basic but strong designs that had gone before. The resultant Art Nouveau period saw no restrictions on how nature and animal motifs should be employed. Despite only really having a very short peak, between 1890 and 1910, Art Nouveau remains incredibly important over a century later. 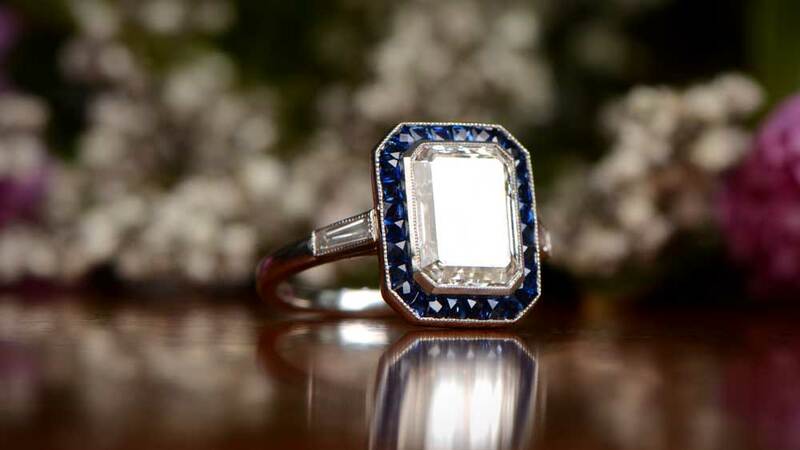 The cottage industry of homemade crafts and jewelry which dominate the likes of Instagram today owe their very existence to the movement, and pieces still appear regularly in the best jewelry houses worldwide. By 1910, though, Art Nouveau as a mainstream style movement was all but gone. The beginning of the 20th century saw massive industrialization, and this ushered in the Art Deco period. Art Deco, with its angles and well-defined symmetry, is everything Art Nouveau isn’t. As buildings took on a more up and down style, so art and jewelry followed. The introduction of mechanization in all fields also filtered down to jewelry making. Suddenly, producing pieces took a fraction of the time previously required. Cutting diamonds now took hours, instead of days or even months. Art Deco is probably the most important style period in history. Even though we’re officially 80 years past the end of the period, it is still all around us. Anything can be described as a particular style, however prominent it may or may not be. Where Art Nouveau differs is that it is a total style. That is, it goes beyond influencing just one or two styles. As an example, clothing has many styles, but few break out past one or two very small areas. Art Nouveau is different in that it has influenced everything from painting and graphic art to jewelry and metal work. Many uses of Art Nouveau are immediately recognizable. Based on natural forms and structures, in particular, the curved shapes of plants and flowers, the gentleness of Art Nouveau is often its strong point. However, Art Nouveau is also home to many bold colors and a wide range of materials not previously seen in art. Jewelry houses, as well as yellow gold and many precious and semi-precious stones, also used enamel, wood, base metals and other elements within their designs. Dragonflies, butterflies, flowers and many more natural designs all benefit from this open approach. Art Deco also followed a total style path, taking over from Art Nouveau almost completely by 1910. The difference is that Art Deco wasn’t just popular in western Europe, as was the case with Art Nouveau. Globalization meant that news and information reached much farther than ever before. Art Deco, as a result, became the first truly global style. It’s easy to assume that Art Deco remains popular today simply because of its appeal, but there is more to it than simple aesthetics. Because of the massive volume of buildings, cars, jewelry and other things appearing, Art Deco is all around us all the time. This ubiquity means it never quite goes away, even as fashions change. The form-first approach of Art Nouveau doesn’t appeal to everyone, but it doesn’t make brooches, rings and necklaces any less beautiful. Because the style takes the line it does with natural forms, it means designers can go all out to produce spectacular, eye-catching pieces. Dozens of colors are often used, with gemstones usually taking pride of place. Colored enamel or metal, or even wood and other natural materials are very common. Really, if ever a physical style manifests itself perfectly, it’s Art Nouveau with the incredibly intricate and complex works produced by master craftsmen. Reading the above, you might be forgiven for thinking that Art Deco is somehow less art-worthy than Art Nouveau, but that wouldn’t just be unfair, it would also be inaccurate. Art Deco is every bit as artistic, just in a different way. Out go the flowing, sweeping lines and nature symbols, and in come the aggressive, symmetrical designs which literally formed the building blocks of the early 20th century. Old high-rise buildings in cities like NY and Chicago are fine examples of Art Deco architecture. Square and straight as a die, a consistent uniform layout and not a curve in sight. All these things are what Art Deco gave to the expansion of our towns and cities in the 1920s. In terms of art and jewelry, there were certain things which made Art Deco pieces stand out. White metals, instead of yellow gold, geometric designs, gemstones cut to fit instead of settings made to hold a particular stone, often all three will be present. Intricate filigree was common on rings, but almost always in a symmetrical design. The Asscher cut and other geometric cuts became very popular, running alongside old European cut diamonds. Art Deco was the Rhett to Art Nouveau’s Scarlett. Bob Dylan was 40 years later when he declared the times were a-changin’. We look now at the 1960s as being the most important period in our nation’s history. Socially it was, of course, but, culturally, it was the 20s and 30s which saw the biggest shift in attitudes. This shift in thought and deed was especially noticeable amongst women. For women, after 30 years of feminine designs, suddenly masculinity and boldness were the order of the day. The time of the speakeasy, flappers, and prohibition made being daring fashionable, and Art Deco was all this and more. Art Deco was the kind of design period where the future had arrived today. Art Nouveau will always have its admirers, and many designers still include it in their designs today. Even when not specifically creating an Art Nouveau piece, elements find their way in. It has a beauty, elegance, and charm that will never truly go out of fashion, and which will always remain appealing. Art Deco is the past, the present, and the future. Still, today, Art Deco influences dominate our everyday lives. In the buildings being erected, in the cars rolling off the production lines, and in the jewelry we buy and wear. That doesn’t mean we automatically think of these things as Art Deco, but maybe we should, at least just a little. 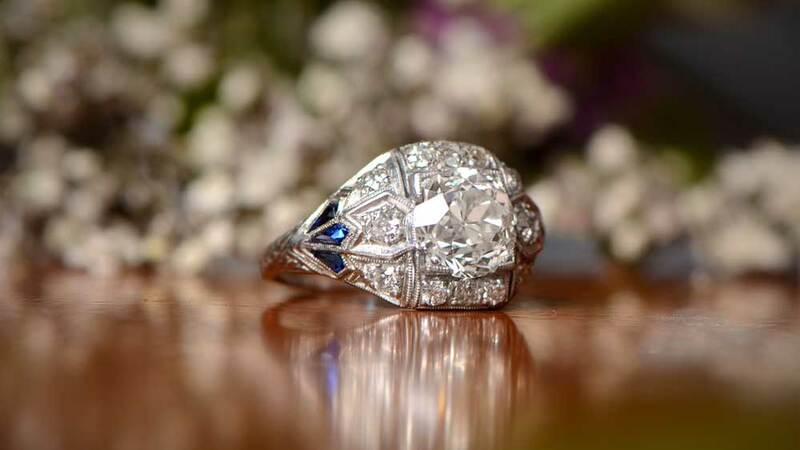 As with other things, engagement rings changed in the period between the beginning of Art Nouveau and the end of Art Deco. From pretty intricate designs came big, bold designs that owed more to having an impact than simply looking pretty. 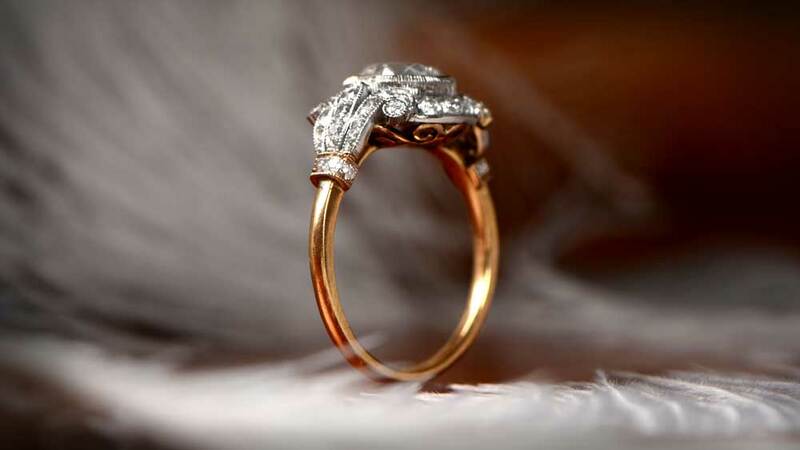 That isn’t to say that Art Deco rings aren’t pretty, because they are, but it was presented in a different way. During the Art Nouveau period, rings were very much part of the movement. Flowing lines and soft gentle curves were the order of the day. The harsh aggression of Art Deco was still seemingly a million miles away, with round old European and old mine cut diamonds dominating. Some later Art Nouveau engagement rings aren’t especially subtle, but early designs brought a lot of the Arts and Crafts movement with them. Open filigree, a later favorite of Art Deco was present in the 1880s and was used perfectly. Suddenly, after 1910, with Art Deco, we were looking much more at cushion cuts, halos, and pavé. Contrasting stones such as sapphires and emeralds made bold additions to the often huge diamonds now used. Gemstones suited to emerald and baguette cuts became increasingly popular, with aquamarine engagement rings a firm favorite. Suddenly, after the often dainty feel of Art Nouveau, big was beautiful. 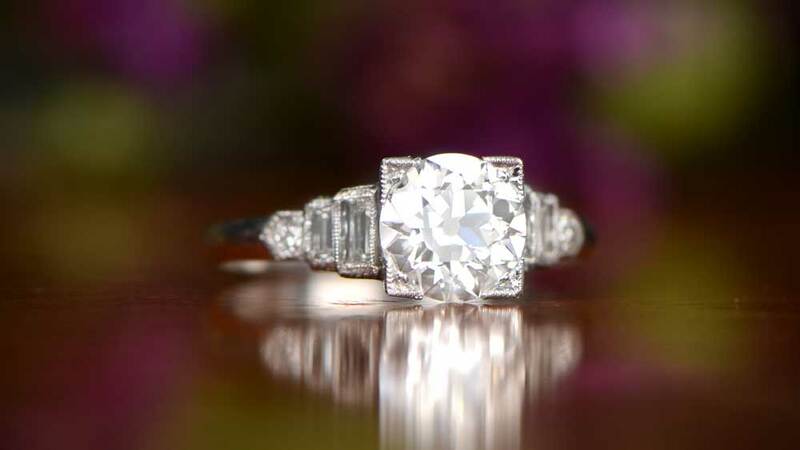 Follow Estate Diamond Jewelry's board Beautiful Rings + Creative Photography on Pinterest. Which Hand Wears the Wedding Band?